In case you missed it, some guy made a fake RT from Bow Wow & attached a photo of him laying up with a dude. 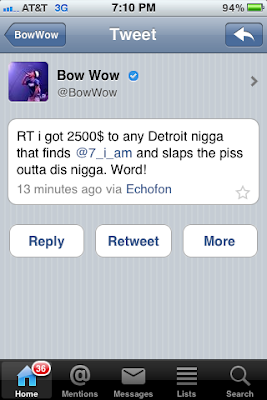 Long story short, Bow Wow caught wind of it & basically put a bounty on this guys head. After realizing this is a crime, especially if the guy gets hurt, Bow Wow's PR team decided to make it seem like Bow Wow got "hacked".. Read More so i can explain to you how completely ridiculous this is.. with screen shots. Bow Wow is no stranger to Twitter meltdowns. He's had countless of them, all of which unfolded via twitter. Just a few years back he said he wishes he was dead. Seriously?! LIFE is hard. You know how many people have been fighting and struggling to get to his spot? I don't know what world he's living in, but the world the rest of us live in, gets tough. Deal with it. You mean to tell me, that someone who just so happens to tweet & type like Bow Wow pretended to be him just to threaten this guy, and then HOURS LATER, starts typing completely different and now is some crazy fan that hacked his twitter? He put a BOUNTY on someone's head! That's a crime! Especially if dude would have really got beaten up. So of course Bow Wow's people had to think of some sort of plan to keep their client/artist outta jail. So he "got hacked". 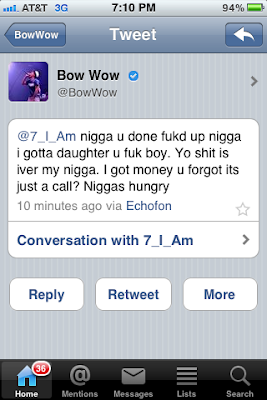 BUT, last night, and every other night, Bow Wow was tweeting from Echofon, including the threats and prior to them. So now all of sudden he's/the hacker is tweeting from a blackberry.. *crickets* He should have started tweeting from the blackberry when he made those threats. IDIOTS. 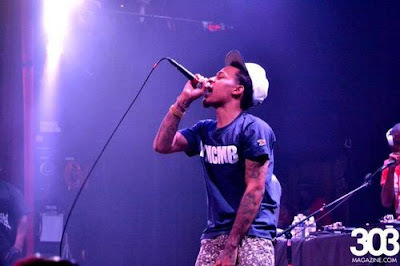 Bow Wow, take a hiatus, & FIRE YOUR PR TEAM. They think you're stupid, and everyone else in the world is stupid. NEWSFLASH, we're not dumb. And the whole world patiently waited to see what story ya'll would come up with and THIS is the best you got? An unsigned rapper? FIRST OFF, What unsigned rapper is even thinking of Bow Wow to want to use his twitter page for promo??? NOT ONE. 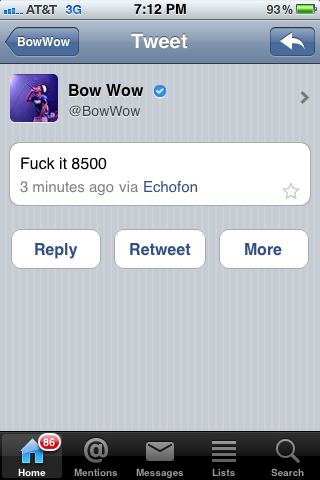 Bow Wow has no pull whatsoever. You mean to tell ME, that an unsigned rapper is gonna hack a completely irrelevant rapper's page, asking for a follow.. from the page you just hacked? C'mon man! Notice the above and this tweet right here were all from Echofon. Now see below. Let's be real here. They need to just come clean. Yes Bow Wow made the threats, but he apologizes. That's all. Don't play us all for fools, though.